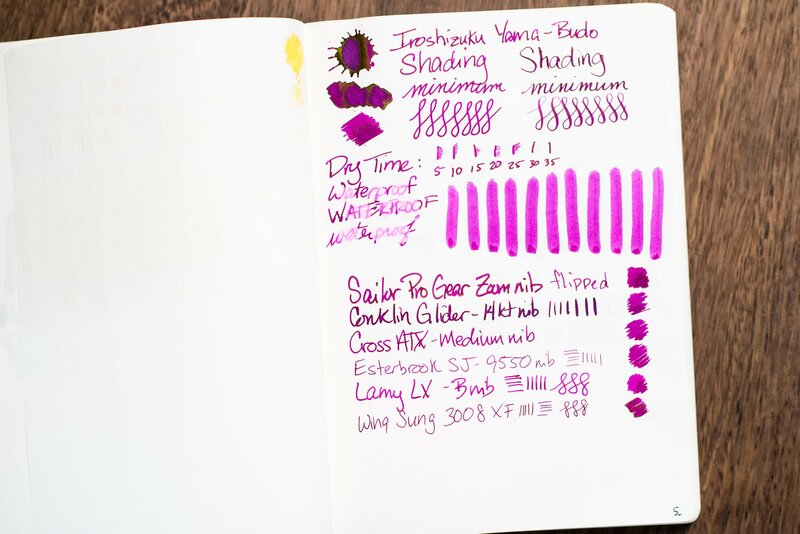 If you have a variety of different inks and sometimes have trouble remembering what they look like or which are your favorites, you might consider creating a fountain pen ink journal. An ink journal can take on a few different forms. In this article I’ll describe a few different ways to make an ink journal, as well as suggesting some different notebooks that might work for you. You can create an ink journal for a few different reasons. One reason might be to keep track of which pens are currently filled with which inks. 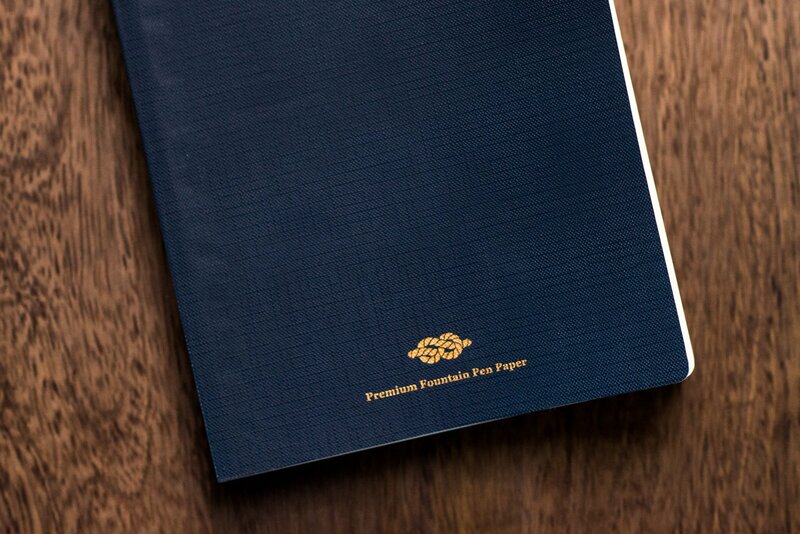 This type of journal also lets you look back at different pen and ink pairings to find your favorites. 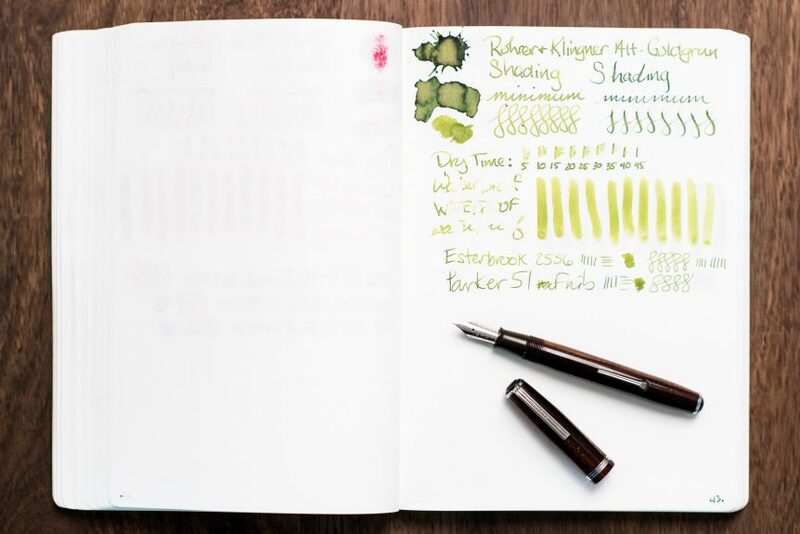 Another reason to make an ink journal is to have a quick and easy way to reference the different inks that you have. You might think of keeping an inked pen journal as similar to keeping a diary. In this type of journal, you simply keep track of the different pen and ink combinations you’ve used. Over time, you’ll build up a journal of different combinations which should help you to see which you prefer. 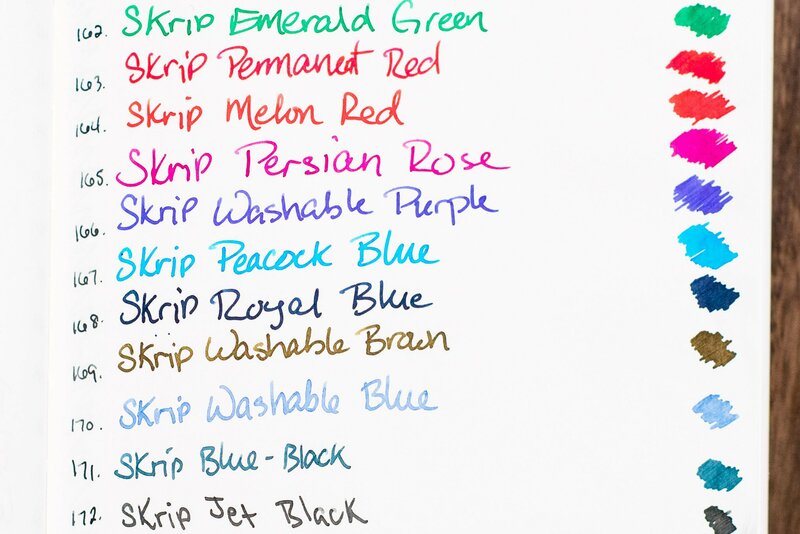 It can also be interesting to see which pens or inks you use more often and which combinations you prefer. I kept an inked pen journal for a while. Mine was fairly simple. I wrote the pen, nib and ink that I used and that’s it. There was one entry per line. Some people might choose to write the dates that they inked and cleaned the pen, but I personally didn’t care about it being that detailed. A page from my currently inked journal. One ink entry in my detailed ink journal. As you can see, I also track which pens I’ve used with each ink. I prefer this to the inked pen journal because I can see at a glance how one ink looks when used with different pens. You might also notice that I have a page number in the lower-right corner of the page. In the front of my ink journal I created a table of contents so that I can quickly find a particular ink. Here is one page from my table of contents. I don’t have any real order to how my inks are arranged. You can see that there are definitely some groupings by brand, but other than that there isn’t much rhyme or reason to the layout. 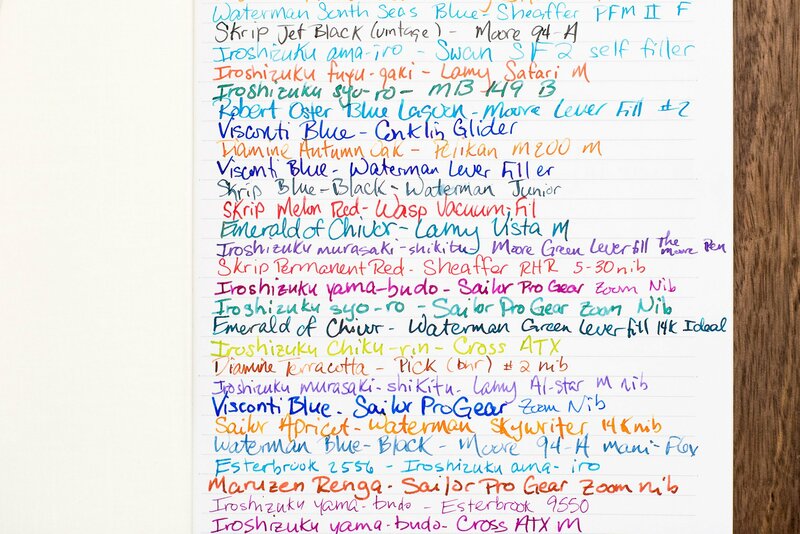 I’ve seen some people group their inks by color and others by brand. If this is how you want to lay out your ink journal, one thing that you’ll want to be sure to do is leave some space for future inks. One mistake that I made when I first created my ink journal was with the page numbers. I read the description for my notebook and it said that it had something like 380 pages. I figured that I could fit 20 inks per page in the table of contents, which meant I had room for 360 inks. I created the table of contents and started numbering the pages. It didn’t take me long to realize that I had made a mistake and 380 pages actually means 190 sheets. Now my ink journal has some empty pages up front where the table of contents goes too high, but it still has room for 172 different inks. One benefit to laying out the table of contents and numbering the pages before getting started is you can divide the journal into two separate sections if you’d like. For example, I have quite a few vintage inks that I use and I wanted to keep them separated from my modern inks. My vintage inks start at the back of my ink journal and the modern inks start at the front. This not only keeps them separated, but also gives each section room to grow towards the middle and I don’t have to worry about how much space I allocate for each section. Here are some of the vintage inks in my journal. Do you care about sheen? Do you want to use both sides of a page? What kind of binding do you prefer? Do you want blank or lined paper? These are just a few of the questions you’ll need to ask yourself before getting started on an ink journal. For example, if you don’t really care about sheen, your notebook options will look a lot different than if you do care about sheen. If you want a notebook that lays flat, a spiral-bound notebook will likely be your best option. If you want to write on both sides of a page, you’ll want paper with low ghosting. As for specific notebook recommendations, I have a few that are worth considering. Any notebook with Tomoe River paper in it is a good choice. I use the Enigma from Taroko Shop on Etsy, but any of their notebooks should work just fine including these that are on Amazon. You can also find other Tomoe River notebooks on Amazon. This is the cover of the Taroko Enigma notebook that I use for my ink journal. Life also makes good notebooks with great paper, although they mostly use cream-colored paper, so that will affect how your inks look. I love their line of Noble Notebooks. If you don’t want the cream paper of Life, Midori MD notebooks would also be a great choice. If you don’t want to spend as much and don’t mind a lined notebook, either a Black n’ Red or Clairefontaine Basics notebook would be a good option. Both are very fountain pen friendly and show good ink characteristics. I hope that, if you don’t currently have an ink journal, you consider creating one. They make a great reference tool and are fun to create. You can include as much or as little detail as you’d like. 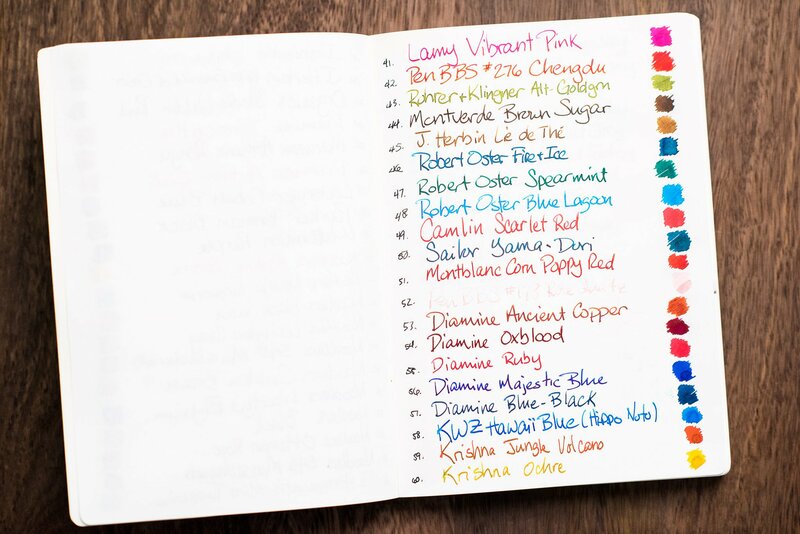 I’ve seen some people who simply have swatches of ink along with the name of the ink in their journal. Others have even more information than I do. It’s up to you to decide what information you will find useful to have in your journal. Have fun! That’s one of the aspects I find to be the most useful. If I want to use a particular ink for its shading, I can see which pens it shades the best in (or try a new one instead). Thanks for reading! The perfect followup to your chromatography post – thank you! I have a Leuchtturm 1917 notebook that I use for a variety of fountain pen related things (ink swatches to help me pick the next color I’m going to use, handwriting practice, story ideas, poetry repository, etc), but I’m definitely convinced a separate ink journal is a worthwhile pursuit. And I’ll never turn down an excuse to buy a new notebook.